Please refer to our stock # Hasui166 when inquiring. This edition has a greenish glow. 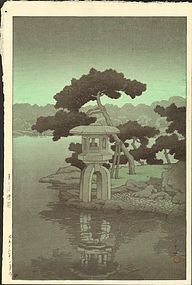 Compare with our Hasui 152. Publisher: Watanabe Shozaburo. Bears the Watanabe 6 mm round seal in the lower left corner. This is a lifetime edition printed between 1946 and 1957. Condition: Very good. Some scuffs in the form of faint darker spots in the sky and lines to the right of lantern reflection in the pool. Please see photos.